Its official! 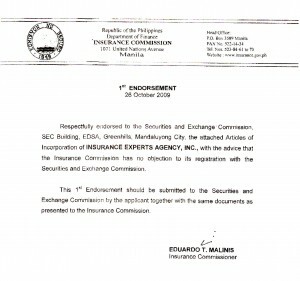 We already got our new corporate name from USG Insurance Agency- Greenhills Inc. to Insurance Experts Agency, Inc. While SEC papers and other pertinent documents are still on the works. We will still be using USGIA-GH's bank account until further announcement. Thank you all for your patronage! rtrude Pingol, Sonnie Santos for the Website and Dave Tuason for the Hosting.